Eleven hours of waiting, watching. Yesterday we sat for six hours on a bamboo bench in an intermittent drizzle and scanned a distant slope hoping for a glimpse of the largest, most endangered raptor on the planet, the Philippine Eagle, national bird of the Philippines. Today we’ve been scoping the mountain ridges intently for another five hours, this time in the blazing sun. Soaring Oriental Honey-buzzards and Phil- ippine Serpent Eagles temporarily get our adrenaline pumping, but they’re only diversions. Finally, Pete, a fellow bird watcher, yells, “A big, white bird landed in the tree by the cliff.” We had studied the distant slopes for so long we had the landmarks memorized. I focus the scope to 50x and see the object of our quest perched regally in the distant tree about a mile away. The eagle flies to another tree, and we spot an immature. The adult soon departs as the juvenile bends over and rips pieces from the prey its parent brought and eagerly gulps them down. After its meal, the juvenile flies a short distance to another tree, sits a while, then flies back as though practicing its flying. Transfixed, we spend the next two hours gazing at the bird. Even in captivity, a Philippine Eagle is a stunning sight to behold with its shaggy crest and huge size. After flying from Manila to Cagayan de Oro on the island of Mindanao, we drove for four hours on a narrow, winding mountain road through remote villages with thatched-roof, bamboo huts, then transferred ourselves and our gear to the back of a four-wheel-drive flatbed truck. Finally, at the end of the muddy road, villagers lashed our luggage onto the backs of some scrawny little horses. We pulled on rubber boots and started a one-hour ascent up a slippery trail, sometimes sloshing through ankle-deep slush, to reach our rustic bird-watching “ecolodge”—a decaying barn with a dormitory loft that had no beds or flush toilets, and only a plastic bucket for bathing. At that point, we still had another two-hour, rubber-boot hike to reach the eagle-viewing site—a long bench made from split bamboo in a hacked-away clearing in an overgrown potato field that nature has reclaimed. But the view is spectacular, a deep gorge with a hidden river encompassing a long ridge and twin rounded mountains—perfect habitat for the soaring kings of the rainforest. Mount Kitenglad birding ecolodge was built in 1993 with a grant from Del Monte. During our hours of idle watching, flocks of small birds dash past to break the monotony. Sparrow-sized Chestnut Munias, a popular cage bird in the pet trade and former national bird of the Philippines, zip into the tall grass. Apo Mynas, black with a brilliant yellow patch of bare skin around their eyes and a fuzzy crest, perch and watch us watch them. The smaller birds are exciting, yet not the reason we flew 7,000 miles and tramped four miles up a muddy trail. But with the first sight of the magnificent eagle, we forget the hardships. 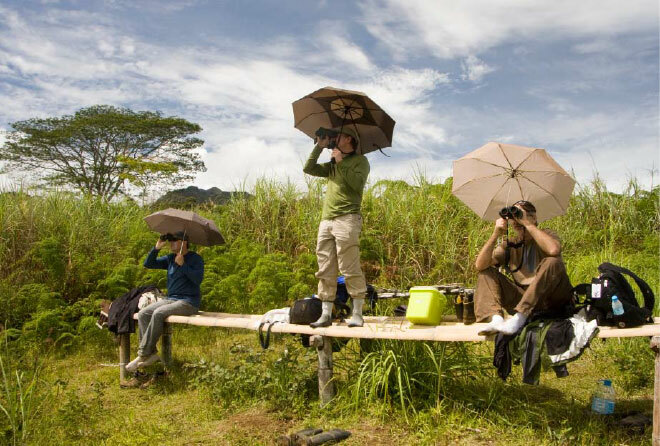 Birders scan the skies at the Mount Kitenglad eagle viewpoint. David Tomb, a wildlife artist who organized our group of four, previously created life-sized paintings of the Mexican Tufted Jay to raise funds for a wildlife preserve in the oak canyons near Mazatlan (see “A Canyon of Their Own,” Living Bird, Summer, 2009). For the current project, he is planning an exhibit at his San Francisco gallery featuring the Philippine Eagle and other birds of Mindanao to benefit the foundation and its education projects. So seeing the eagle fires our enthusiasm for better reasons than achieving another check on our life lists. After a few quick first views, we take turns at the scope for longer studies of the eagle. Then David shouts, “Look! A monkey! Climbing the limb above the eagle!” Again we rush to the scope. The 3-foot-tall raptor with a 7-foot wingspan was formerly known by the more sensational name of Philippine Monkey-eating Eagle, but the juvenile pays no attention to the foolhardy macaque perched above it in the canopy. As every birder knows, not every adventure has a checklist payoff. With hundreds of square miles surrounding Mount Kitanglad, our chance of spotting the eagle, much less a nest, was far from assured. A pair of Philippine Eagles requires 50 square miles of hunting territory to be able to catch enough flying lemurs, squirrels, snakes, civets, hornbills, and long-tailed macaques to nourish a nestling. Though the area is designated a natural park, most of the land surrounding the mountain habitat, with the exception of deep ravines, has been cleared by slash-and-burn farming. Only the forest on the steep mountain slopes and rugged ridges remains intact. The trail from the lodge passes one field after another—some new, some exhausted and overgrown with thorny lantana, bushy sunflowers, and a bramble of invasive weedy species. In many places, the shallow layer of soil has washed away, exposing barren mounds of slippery, infertile red clay. 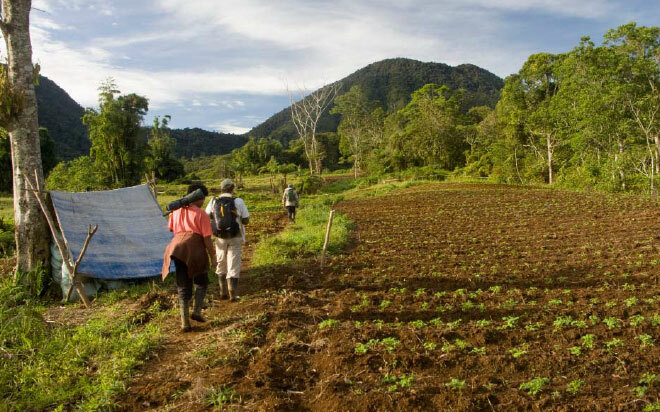 Farmers plow with water buffalos and pack out 200-pound sacks of cabbage, corn, peppers, taro, potatoes, and tomatoes using the same workhorses that toted our luggage on the same muddy foot trails we labored up. Farmers sell their cabbage to dealers in the village for 6 pesos per kilogram ($.06 per pound). Dealers get 15 pesos per kilogram wholesale, and the stores in Manila charge 45 pesos per kilogram ($.47 per pound) retail. Field workers receive about 150 to 200 pesos a day ($3.35–$4.50). The ever-expanding farmland pushes wildlife into the diminishing forest and eventually to extinction. Along the trail, we see a Sunbird and tramp across the charred, fractured remains of a recently burned section to the edge of the uncut, verdant forest. Foot-tall fiddleheads sprout from rhizomes through the charred soil and cover the denuded plot. In a few weeks waist-high ferns will blanket the hillside. Potato seedlings sprout from the broad rows of recently plowed and planted adjacent fields. Visiting bird watchers hiked past one slash-and-burn farm after another on the way to the Philippine Eagle viewing area. The variety of bird calls announces a mixed flock foraging through the canopy. Busy little Mountain White-eyes, which we see in abundance, skitter through the leaves, joined by the flamboyant Coppersmith Barbet, Grey-hooded Sunbird, Fire-breasted Flowerpecker, and Rufus-headed Tailorbird. Mixed flocks give us the exciting opportunity to see a flush of rainforest birds all at once, especially when they congregate around a tree in flower or fruit. 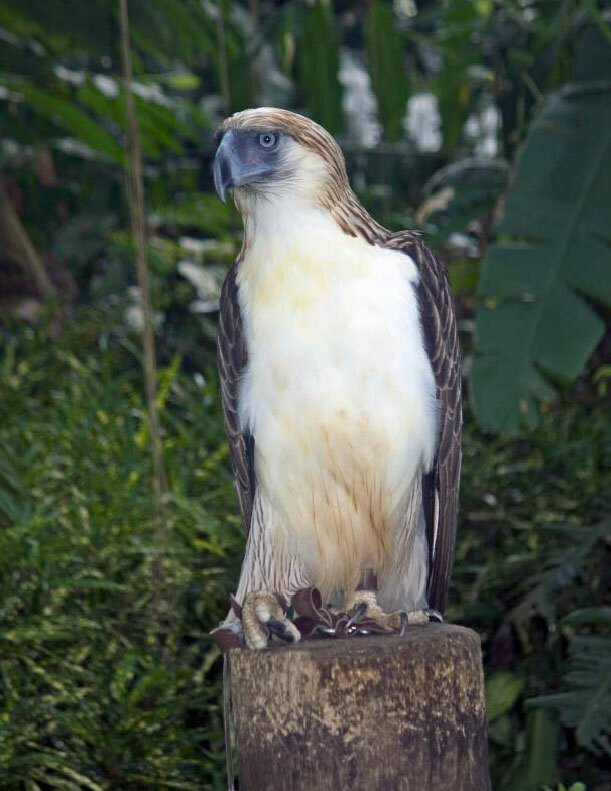 Deforestation and illegal hunting pose the greatest threat to the Philippine Eagle and other forest birds. The Philippines topped 100 million inhabitants in 2010. Estimates of how much old-growth forest remains vary greatly, but a best guess is somewhere near 7 percent. From what we see during our two-week visit on Mindanao, primary forest is doomed in the short term and secondary forest in the near future. With an exploding population and a government not interested in environmental controls or conservation, the forest will of necessity be converted into farmland or banana and palm-oil plantations. Danny Docenos (left) is one of the bird guides at Mount Kitenglad ecolodge. Bird guide Carlito Gayramara (center) and his family operate the ecolodge. Nicky Icarangal (right) leads birding tours for Birding Adventure Philippines. The near-perpendicular ridges and slopes of Mount Kitanglad resist farming and harbor the breeding pair of Philippine Eagles we see. Other populations live in remote areas, most too rugged to inventory, on the islands of Luzon, Samar, and Leyte. The Philippine Eagle Foundation estimates that enough habitat exists for at most 200 pairs in the mountainous regions of Mindanao and another 200 pairs in the rest of the archipelago. As the finale of our trip, we visit the Philippine Eagle Foundation in Davao, largest city on Mindanao. As part of the yearlong research for his art exhibit, David has conferred with the foundation and arranged for us to meet the staff and tour the grounds. 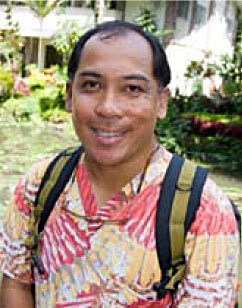 Executive director Dennis Salvador has been with the foundation since it began. We sit in his office and dodge Glossy Swiftlets that dart though the open window to get to their nests in the hall. We cross the bridge into a wooded compound and see more birds foraging in the trees than kept in cages. A Blue-throated Bee-eater and Hooded Pitta temporarily distract us from a tethered Brahminy Kite sitting on a limb a few feet above the path. It poses for us unperturbed. Three large flight cages built into the hillside hold breeding pairs of Philippine Eagles. Other cages hold fishing eagles, serpent eagles, hawk eagles, and some native mammals. We meet Anna Mae Sumaya, director of breeding biology, in front of a Philippine Eagle perched on a stump just off the path. The foundation harbors 35 Philippine Eagles, including three males and two females used for artificial insemination, three natural pairs, and six pairs in various stages of bonding. The oldest is 43 years old. Raising and releasing captive-bred eagles into the field presents a host of problems. Of the seven captive-bred and rehabilitated eagles released since 2004, only two have been successful. Anna Mae hopes new techniques and training will improve the odds. The release team monitors the eagle and provides food if needed for three months. But food isn’t the newly released eagle’s greatest threat. “Hunting is a major problem,” Anna Mae says. Dr. Bo Puentespina volunteeers as the veterinarian for the Philippine Eagle Foundation. The morning we arrive at the foundation, avian veterinarian and volunteer Bo Puentespina has just finished operating on an immature eagle with gunshot wounds in its wing and leg. He leads us to a small building and gently opens the door. The eagle lies on a bed of leafy branches in a small cage. 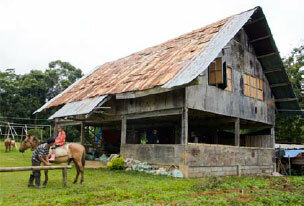 The foundation offers 2,000 pesos (about $45) to any villager who finds a nest and another 2,000 pesos for the village. A field team goes to the village and evaluates the grassroots needs with meetings and discussions. The majestic Philippine Eagle, king of the rainforest, stares at us from its perch as we leave the foundation. 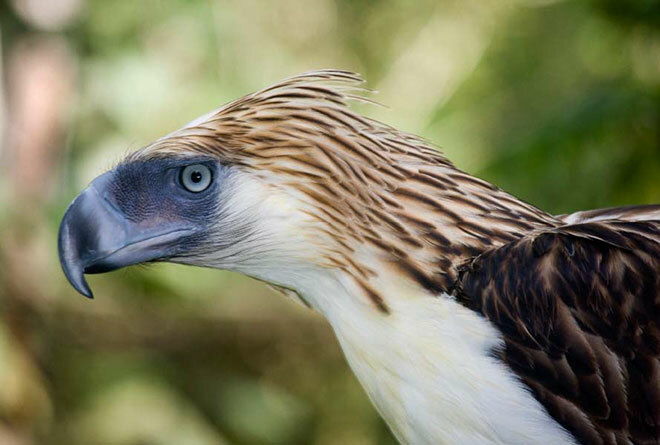 Despite a lack of government support and with official policies that encourage mining and clear-cutting for agro-industrial plantations, the Philippine Eagle Foundation pushes forward with a commitment forged in passion and persistence. While waiting in line to enter the Manila airport on my way home, I pass a large sign on the door that reads: “Warning, Wildlife Resources and Conservation and Protection Act 9147 prohibits collecting, hunting, or possessing wildlife.” How ironic. George Oxford Miller is a freelance writer and photographer based in Albuquerque, New Mexico. He frequently writes for this magazine. The Philippine Eagle Foundation uses nonreleasable male eagles that can’t be released for artificial insemination and public display.